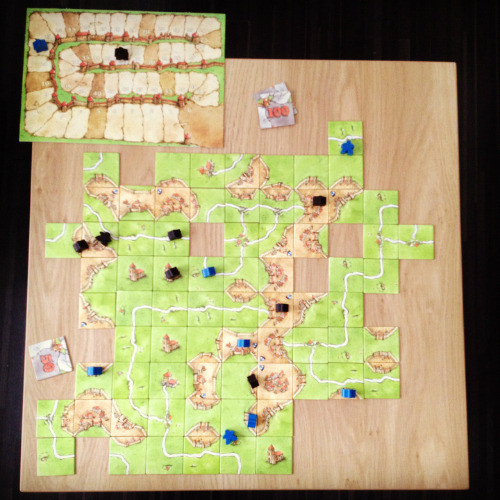 One of my very first board game reviews from when I started blogging, is Carcassonne. I decided to repost it on my new blog to warm you up for similar future posts. 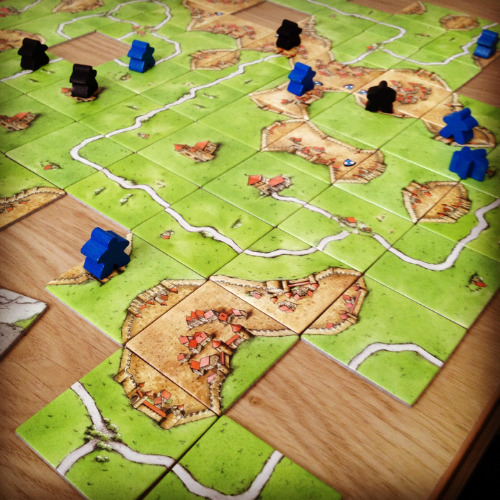 Let's get started with Carcassonne! First I bought the basic game and an expansion. But after a while I became completely hooked. 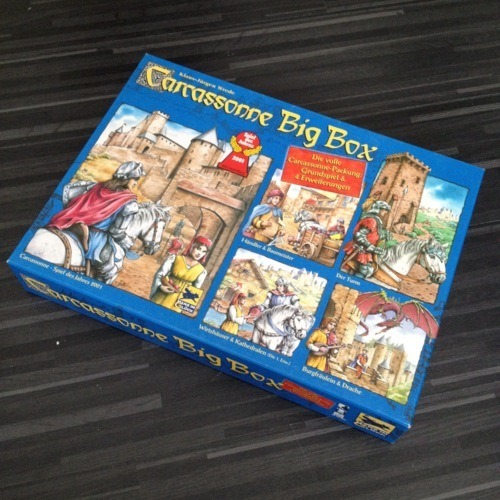 And one day I came across this: Carcassonne Big Box. I feel like it was totally worth the price, since I found the second version of the Big Box for 30 euros! If you buy them individually, you would spent a lot more money on it. This is a first read and then play review. I have taken pictures from one game session so you can see how a game could go. 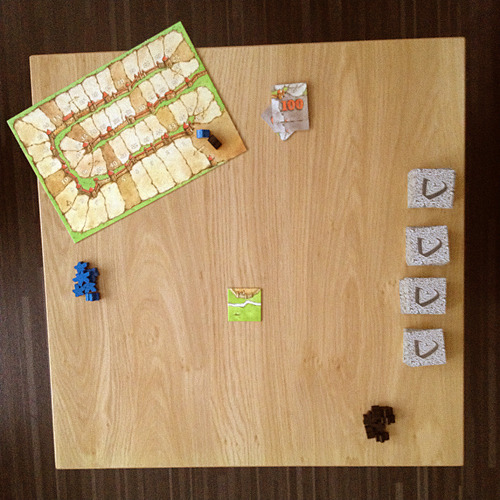 On the picture right above this text, you can see the set-up for a game with 2 players. You have the scoreboard in the left upper corner, next to it are point-tiles. Because the scoreboard counts from 0 to 49, you'll get a score-tile with the number 50 on the one side and 100 on the other. So if you gain 50 points you just take one and put it on your side of the table with the number 50 facing upwards. When you reach a 100 points, you just turn it so the number 100 is facing upwards. When you gain 150 points, you'll have to take a new score-tile and lay it next to your 100 points score-tile and so on…. 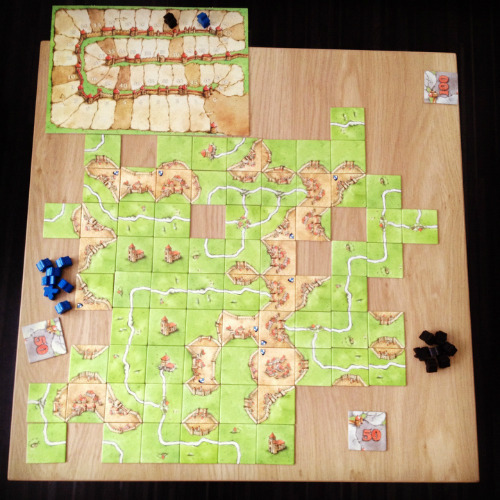 Carcassonne, is a quite simple game in a medieval setting and it can be played with 2 to 5 players. The game board is always changing, since you'll be building it during the game. So it starts with a single tile faced up. Each turn you will have to pick a tile from a stack that's faced down and match it to the ones that are already faced-up on the table. As you can see on the pictures below: you can build cities, roads, fields and a monastery (also called a cloister) in the basic game. So how can you make points out of that. 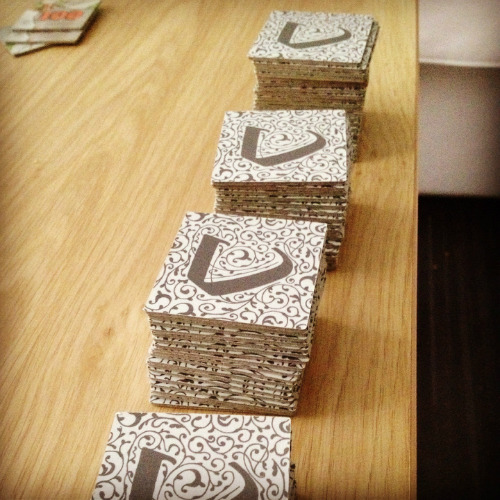 Well, each time it's your turn, you lay down a tile and if you wish you can put a wooden figure on it to claim it. This is only allowed when it is your turn and only on the tile you have just put on the table. If you lay the figure down in the field, he's a farmer, if you put it in a city it's a knight, on the road it's a robber and on the monastery it's a monk. Now, the placed wooden figure has to stay in that same spot until that structure is completed. Or if it's a field, until the end of the game. If you wondered: No one can claim the same city, road, or field directly. You'll have to be a bit sly about that. So how do you claim someone else's street, field or city? You cannot claim someones monastery since it's not really expandable. (I'll tell more about that later) The other 3 are. A city is completed when it is totally surrounded by walls, a road is completed when it has a beginning and an end. This can be a city, a crossroad or a monastery. And a field, well that's a bit trickier. A field has boundaries like the outside walls of a city and roads that pass trough it. But not if the road is running in a loop. On the picture right above, you can see a large city with 2 black figures and one blue in it. 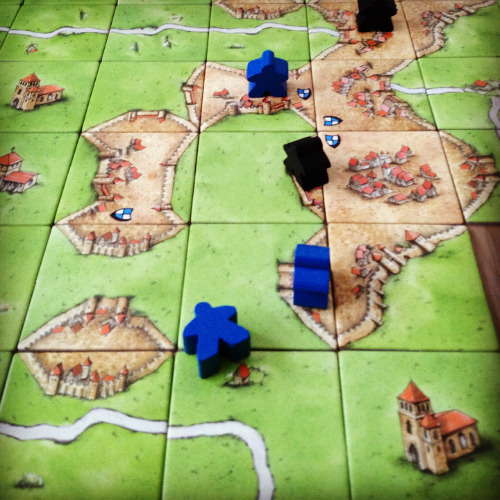 So the only way to steal the city (if I would be the blue player), is like you can see, to put down a tile with a city that's not directly connected to the larger (already claimed) city. The next time the blue player can put a tile between the two to connect them and make a bigger city out of it. There are trapdoors about claiming someone's property. 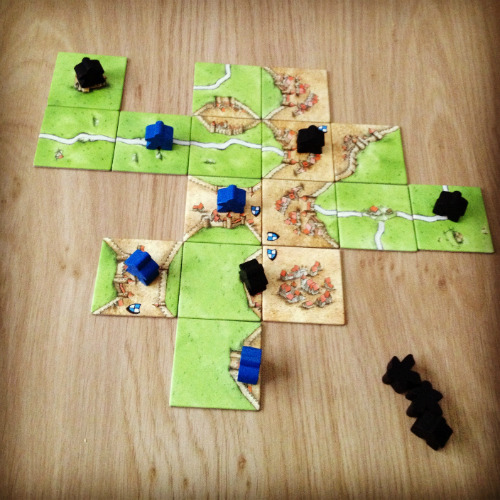 When both players have one wooden figure in the same city, road or field, the points go to neither of them. 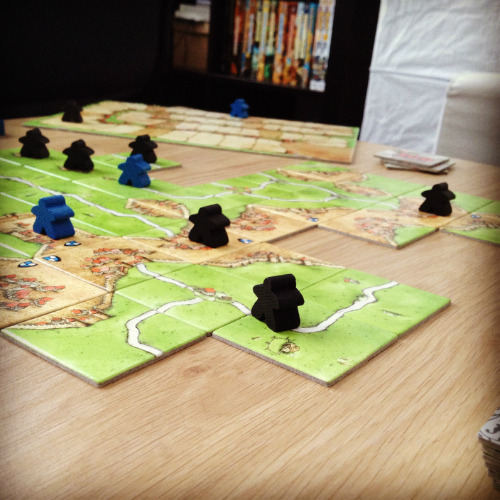 Only the one who has the majority of wooden figures on that terrain, will eventually get the points. Now about the monastery. For a monastery to be complete, you'll have to surround it by 8 matching tiles. By matching, I don't mean the same tiles, but that they should fit the adjacent ones. The most of the counting is done directly when a structure is completed. But the uncompleted bits will be count in the end of the game and are slightly reduced. To be clear: the end of the game is when there are no tiles left to play. First I'll start with what every structure is worth. A road: when a road is completed every road tile that is directly connected, counts for one point. An uncomplete road delivers no points. A completed city is worth 2 points per adjacent city-tile (from the same city) But when there's a shield on that tile, that specific tile counts for 3 points. An incomplete city is worth 1 point per tile and 2 points for a shield-tile. A monastery is worth 1 point per tile, complete or not. That doesn't really matter. So the maximum points you can get out of a monastery is 9. Last but not least, a field. The amount of points you get out of a field depends on how many completed cities there are laying in it. It doesn't matter if you or another player built those cities. You get 3 points per completed city that lays in your field. That's about it for my explanation of the game. But you can look here for the official game rules. 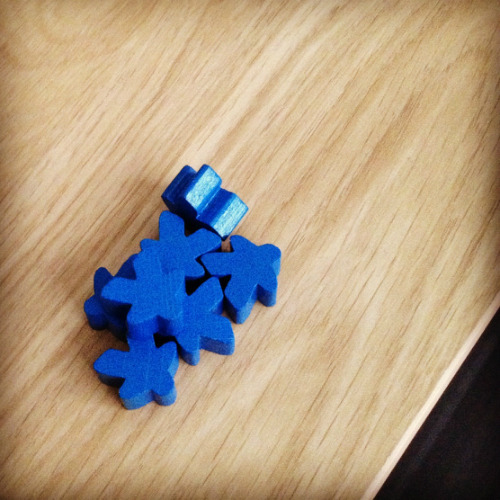 Like I mentioned before it's a relatively simple game, but it can get more complex by adding expansions. There are very small expansions like the river 1 & 2 or the count,… etc. But there are also larger expansions. These expansions bring a fresh feel to the game. And they're also fun to combine, since they make the game even more challenging. 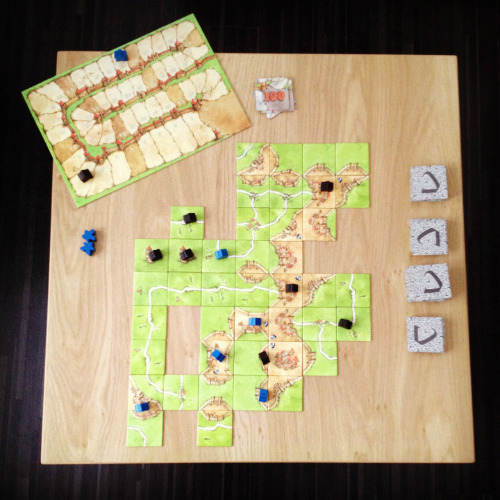 Carcassonne is also playable on Android and iOS! But are brought to you by different developers. This means the the iOS version, which I like more is not available for Android & vice versa. 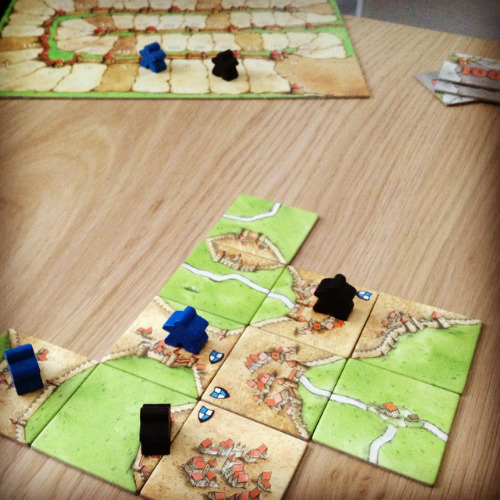 If you like a boardgame that's interchangeable, expandable, can make you think about your actions (strategic) and fun to play with 2 to 5 people (even up till 8 now), Carcassonne is definitely a recommendation. If you're still not sure about it, in Belgium (probably in other countries too) there are specialized game stores where you can go to and play these games. So head out, try and enjoy!